Having been especially virtuous and finished two long-standing wips (yes, the Paintbox Socks are complete – see right) in February, I had the luxury of casting on for absolutely anything I wanted. I’ve been considering shawls for a while, and bought the 7 Small Shawls e-book last month, so I decided to pick from my sock yarn stash and go for the shawl that appealed to me the most. The shawl I picked was Elektra, and the yarn was some German sock yarn found by my Mum. Very long colour changes from darkest blue to palest grey. Gorgeous colours and I thought it would be good in a shawl knit top to bottom or bottom to top, rather than side to side. Sadly, I got through about 5 rows before giving up and ripping back. The yarn is a single ply and is really fuzzy and splitty. I couldn’t get the M1s to work nicely and I think the fuzziness would obscure the lace. Beautiful though it is, I’m not sure I will ever use that yarn for anything. The second attempt at Elektra is using some Knitting Goddess sock yarn given to me by my sister-in-law for my last birthday (actually so was the yarn used in those socks – she has very good colour-sense) and is a combination of browns, oranges and bright blue called ‘All at Sea’. It is lovely and the shawl is getting on very nicely. This evening I ended up creating a large spreadsheet to calculate the percentage of stitches completed at various stages of the shawl so I can make sure I’m not going to run out of yarn. If I do the suggested number of repeats, there will be over 29000 stitches in the shawl. If I do one less repeat, there will be 5000 fewer stitches. This decision has to be made at around a third of the way through the shawl, so there will be some precision-weighing in a few days. 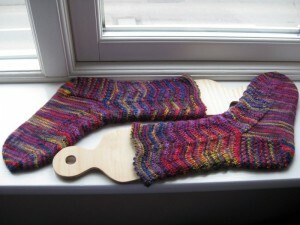 The first 50 rows are very straightforward: mostly garter stitch with evenly spaced increases. Very relaxing. Yesterday I had a training day with work that suggested I should embrace my enthusiasms and work with them rather than trying to fit some generic model of what a priest is meant to be. I’ve ordered a few books on knitting and spirituality to see what I can learn about it. Should be interesting.